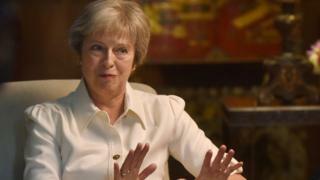 The prime minister has said her Chequers plan for Brexit is the only proposal which will avoid a hard border in Ireland and the break-up of the UK. Theresa May said there needs to be friction-free movement of goods with no customs or regulatory checks between the UK and the EU. She said the people of Northern Ireland deserved to be listened to in the Brexit negotiations. Mrs May was speaking in an interview for the BBC's Panorama programme. "The people of Northern Ireland deserve to be listened to in these negotiations by the UK government as people elsewhere in this country," she said. "I want to ensure that as we go forward we have that strong union, that Northern Ireland - it is part of the United Kingdom and it's important that we deliver for the people of Northern Ireland. "They don't want a hard border between Northern Ireland and Ireland. The only proposal that has been put forward that delivers on them not having that hard border and ensures that we don't carve up the United Kingdom is the Chequers plan." The UK is leaving the European Union on 29 March 2019, and the government's plan - agreed at Chequers in July - has sparked criticism from Brexiteer Tories as well as the EU. Boris Johnson, who has been at odds with Mrs May's vision for Brexit for some time, claimed last week that she had "wrapped a suicide vest" around the British constitution and "handed the detonator" to Brussels.